Please check out my interview on art-is-fun.com! Thaneeya McArdle (artist and creator of the site) was kind enough to feature several of my whimiscal-themed ACEOs and a Q&A on how I work! 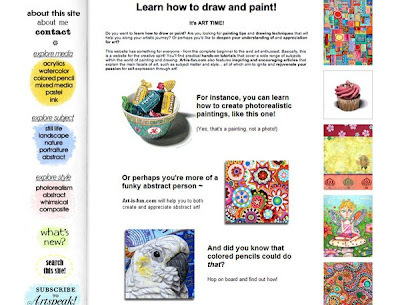 On the site you can find useful tips and art techniques including painting, drawing, various art mediums and genre in a comprehensive and easy-navigate manner. It's great for beginners and those who want to pick up a new medium but don't know how to start. 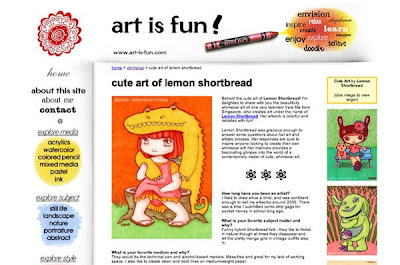 Thanks so much for your lovely post about my Art is Fun site! It is a true delight having your artwork on my site. I'm also really glad to hear that you found some helpful content on the site! All the best to you - I'll definitely be keeping an eye on your work! ooo your interview feature looks awesome! thanks for the link! congratulations! your work is wonderful and it was a great feature!